April 16So you got into college. Now what? Watkins Mill High School students are participating in the Day of Silence to support the LGBTQ club. 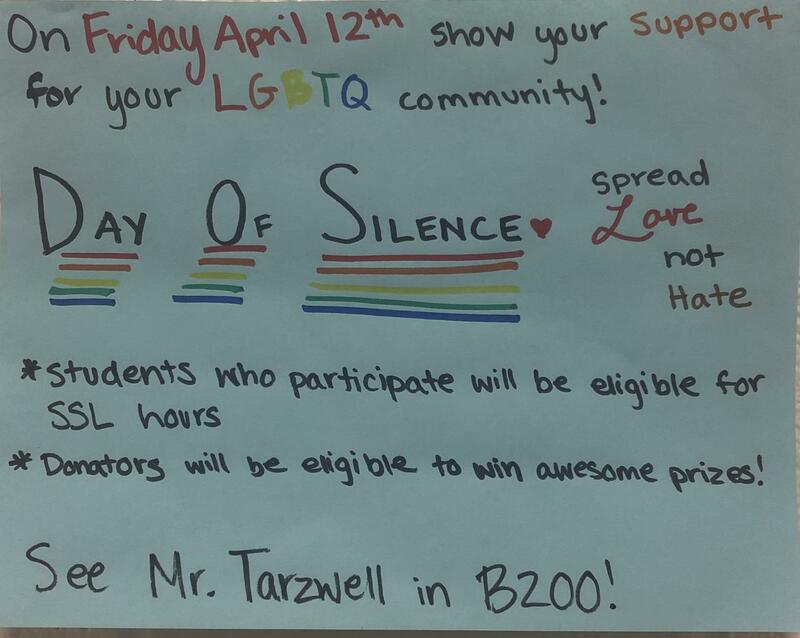 Students at Watkins Mill High School plan to participate in the National Day of Silence on April 12 in a show of support for LGBTQ students. The annual Day of Silence is when LGBTQ students and supporters do not speak for part of the day or the whole day. The event spreads awareness within communities about the difficulties that LGBTQ people face on a daily basis. “[We don’t speak] to highlight people within the community that have felt erased or not been able to speak up because of their identity,” LGBTQ club president Jubilee Robinson said. The LGBTQ club at Watkins Mill will be participating, along with student volunteers, and anyone from within the community. “Anyone is welcome to be involved. You don’t need to be LGBTQ to be involved. The idea is those who are staying silent appreciate the youth and other people of the LGBTQ community who can’t come out,” LGBTQ sponsor and English teacher Scott Tarzwell said. Students can not only participate by supporting and joining the movement, but they can also get donations from other supporters and contribute that to the cause, similar to what the club did the previous year. “Last year we donated some money to the Rainbow Youth Alliance, which is a Montgomery Youth Council in Rockville,” Tarzwell added. This year, the LGBTQ club is taking it a step further and partnering up with Paint Branch High School, which obtained a grant to put forth a motion regarding LGBTQ awareness. The money raised will be sent to Paint Branch, which will help the club participate in another LGBTQ event. “We are going to submit a float and will march in the gay pride parade in DC,” Tarzwell added. “I’m participating in this event because I just want to support those who feel passionate about this cause … all people matter,” junior Precious Agyekum said. The event highlights the physical, emotional, and mental struggles that people within the LGBTQ community face. “We want to spread a message of intolerance towards being silenced,” Robinson said. “I hope this sends across a message that those silenced deserve to be heard no matter what,” Agyekum added. To participate or donate, see Tarzwell in room B200 or any LGBTQ club member. Sign me up for daily updates! What is the best Girl Scout Cookie? I'm not paying $4 for a box of cookies!